Place ribs in a large bowl or resealable plastic bag, set aside. In 4-cup glass measure, stir together vinegar, water, oil, molasses, salt, red pepper flakes and cayenne pepper until salt is dissolved. Remove 1/2 cup marinade; set aside. 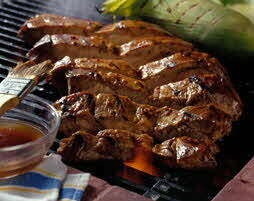 Add remaining marinade to ribs; seal bag and marinate for 4 - 6 hours in the refrigerator. Remove ribs from marinade; discard marinade.